Pushing a hand broom requires a lot more time and energy than a mechanical powered broom. That’s where rotary brooms came in. Today, there are many types of brooms and sweepers – walk-behind sidewalk sweepers, street sweepers, those pushed by tractors, etc. Rotary brooms for tractors may be motorized in a number of different ways – by the tractor engine/transmission, a drive shaft from the transaxle/transmission, a hydraulic mower powered off the tractor hydraulic system, or even a separate pump powered by the tractor power take-off. To add versatility and allow the operator to motion debris to the sides, angle the rotary broom. On a small lawn tractor, change the angle by pulling a pin and manually changing it. Different models and set ups may require you to use a manual crank to change the angle. Larger lawn and garden tractors, subcompacts and compact tractors, may have hydraulically angling systems. 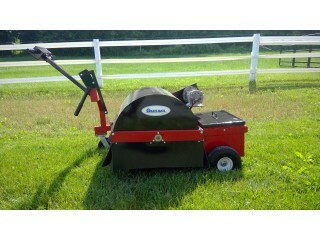 Can be used on a variety of materials such as gravel, mulch, dirt, leaves, thatch, snow, etc.